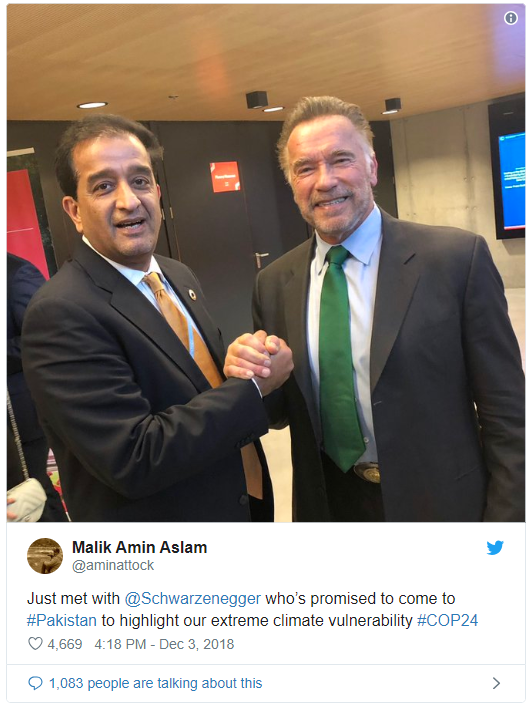 Famed as 'Terminator' Arnold Schwarzenegger, who is a former California Governor and Hollywood superstar, has vowed to come to Pakistan, Prime Minister’s Advisor for Climate Change Malik Amin Aslam tweeted. As per details, Malik shared a photo with Schwarzenegger and stated that the Austrian-American politician had promised to travel to Pakistan to highlight the country’s extreme climate vulnerability. Malik is in Poland to represent Pakistan at the 24th Conference of the Parties (COP24) of the United Nations Framework Convention on Climate Change. Arnold Schwarzenegger is renowned all over the world for being a world champion bodybuilder, Hollywood action hero, successful businessman, environmentalist, philanthropist, best-selling author, and California’s 38th Governor. The athlete and actor was born in Thal, Austria in 1947. In 2003, Schwarzenegger held reins as a Governor of the State of California in a historic recall election and as governor ushered in an era of innovative leadership and extraordinary public service, as per his official website. I am T800 a cybernetic organism, living tissue over a metal endoskeleton.